My friends, what happens when a person dies? Does he go someplace? Does he go to heaven or to hell, or some other place? Is there any life after death, and if so, what is that life? Every spring, at the time they call Easter, people celebrate as they believe the resurrection of Jesus Christ. Actually, as Jesus said on the cross of those that were crucifying Him, "They know not what they do." Nevertheless, my friends, Jesus was explaining something to the Pharisees that showed very plainly that He was not resurrected on Sunday and that the Crucifixion did not occur on that day that we call "Good Friday." Now, as we're going through the New Testament — Matthew, Mark, Luke and John in another summary of it to see why it is that we have not heard the very teaching of Jesus, why it is that the Gospel of Jesus Christ has not been preached and most of us had not heard it, that is, the things that Jesus taught, the things that Jesus preached? Why is it we haven't heard it but another message in the place of it? It's rather astonishing when we go through. Now, here we were in Matthew the twelfth chapter and there was one brought to Jesus possessed of a demon and Jesus cast out the demon and the Pharisees accused Him and they said He did it by the Devil or by Satan the prince of the demons. And then Jesus had said, "If Satan casts out Satan then his house is divided and a house divided against itself cannot stand." A kingdom or Satan's kingdom is divided against itself and if his kingdom is divided how can he stand? But if I by Beelzebub cast out the demons by whom do your sons cast them out? But if I by the Spirit of God casts them out then He said, is the kingdom, that's the Government of God, come nigh unto you." Now, the Kingdom of God is both the Government of God and the Family of God as I've explained to you so many many times. That is the message that Jesus preached. He preached about the Government of God and that God is the Supreme Ruler and that men should live by every word of God as He said. Now, I know that many profess to do that today. Some churches profess to do it and yet they refuse. For instance, the very churches that will profess to live by every word of God and naturally they observe Christmas and Easter. And if you ask them to find out what Bible authority they have for doing that, they cannot give it to you. December 25th is not Christ's birthday. The wise men presented gifts to Christ but they didn't do it on His birthday and it had nothing to do with His birthday. He was born to be the King of the Jews and it was customary to present gifts to a king or any great personage. And it had nothing to do with a birthday, it had nothing to do with Christmas whatsoever and they gave their gifts to Christ. Today, people think they follow it while they trade gifts among themselves on a day that is not the birthday of Christ but for many many centuries prior to Christ was honored as the birthday of Sol the sun god in pagan idolatrous worship, believe it or not. Now, the facts, for instance about Christmas are very easily accessible to anyone. All you have to do is to look into any history or encyclopedia covering the matter. Look up the article "Christmas", just look for the word Christmas in, for instance, the Catholic Encyclopedia which I think you can find in the public library or in the Encyclopedia Britannica or any reputable reliable encyclopedia and many other works that will give the history of it. And you will be surprised to see that it is an ancient pagan festival. You will be surprised to see that Jesus Christ never taught it or commanded it, that the early apostles never observed it, that the Church of God at Jerusalem which was the headquarters Church to which the other churches came when they wanted to straighten out a point of doctrine. But anyway, the Church at Jerusalem, the headquarters Church, never observed any Christmas and neither did they celebrate any Easter. Neither did any of the Gentile Churches so-called that were raised up the apostle Paul although believe it or not and the surprise among surprises when we get to it you'll find that the so-called Gentile Churches of Asia Minor and elsewhere that were raised up by the Apostle Paul were every one of them started out as Jewish and they were started out with Jewish converts and the Gentiles were added later and that is something that will be quite a surprise to lot of people. Well, you look for Christmas in the Bible, you can't find it. You look for Easter in the Bible, the word appeared as a mistranslation in the King James translation in one place in the Book of Acts in the twelfth chapter, I believe it is, of the Book of Acts and even there it is a mistranslation. It's in the twelfth chapter and the fourth verse: "Intending after Easter to bring him forth to the people..." It's speaking of Peter there and of Herod who had taken Peter. And the word Easter is not a correct translation. Now, that's in the English language but the Book of Acts was apparently written by Luke. It apparently was Luke's Book and Luke wrote it in the Greek language and in the Greek language he used a word that was a Hebrew word there instead of a Greek word actually, and it's Pascha, Pascha which is the word translated into English that is Passover. "Intending after [Passover]..." Now, you find a lot about Passover in the Bible. But actually except for this English mistranslation which is an absolute error not inspired of God and is not a correct translating of the original that God inspired at all, except for that, you can't find anything about Easter. Easter is the name of an ancient pagan goddess. Look it up in the Encyclopedia Britannica, look it up wherever you wish and I think you would even find it in the Unabridged Dictionary. It is the name of an ancient pagan goddess and it is paganism. Now, churches will claim that they follow the Bible and they will teach that and yet they observe Christmas, they observe Easter and they claim that the Resurrection was on Sunday when it was not. They celebrate Good Friday and have observances and ceremonies or meetings of some kind on that day and yet the only proof that Jesus ever gave of His identity as the Messiah goes by the wayside and He has to be rejected if the Crucifixion was on Good Friday and the Resurrection was on Sunday. Now, Jesus had said, "If I by the Spirit of God cast out demons then is the Kingdom of God come nigh unto you [come upon you, other places He said 'nigh unto you']." Now, the Kingdom of God was what He preached. Then He called them an offspring of vipers. He said, "Ye offspring of vipers, how can ye, being evil, speak good things? Out of the abundance of the heart the mouth speaketh...And I say unto you, that every idle word that men shall speak, they shall give account thereof in the day of judgment." Now, that's what I want to come to in this broadcast. What is that Day of Judgment? And who's going to be there? And are the dead going to be there or are they going to be in hell or in heaven or where? And what happens to people when they die? There's a time to be born, a time of youth and with its lessons to be learned and its care-free moments, a time to raise a family to watch your children grow and teach them of life, a time for work, for productivity and doing your part for mankind. There's a time to grow old and enjoy your grandchildren and there's a time for death at the end of a full exciting life. Then what — Heaven, Hell, Reincarnation — what is the answer to this question that has long bothered man? You need to know. Read this free booklet — What Is The Reward Of The Saved? It answers this question in a unique and surprising manner. The Bible nowhere promises what you've always assumed. Be sure to read this informative booklet, What Is The Reward Of The Saved? Now, then, at those words Jesus was showing that He was of God and that He cast out these demons by the Power of God which made Him the Messiah and the Son of God. Now, they doubted it and they wouldn't accept that as evidence. It should have been evidence, it was a divine miracle but they wouldn't accept it because they said, "Oh, He's doing that by the power of the Devil." So, they came along, "Then certain of the scribes and the Pharisees answered him, saying, Master, we would see a sign from thee [we would see a sign from thee]." Now, a sign as I explained yesterday is an identifying miracle that is a badge of identity. A sign identifies. For instance, you see a sign hanging out on the corner; it says: "Drugs — Jones and Company" or "Smith and Company" or whatever it is. It tells you who owns it. It tells you what kind of a store it is. It identifies. It describes the identity. Well, that wouldn't be a kind of a sign that you read of in the Bible because in the Bible a sign not only is an identifying sign but it is a miraculous one, it is identified with miracles. And so, you find, for instance, when the Devil is trying to perform such things by, well, by magic or by deceiving or something — "signs and lying wonders" and "miracles and signs" are spoken of in the Bible. A sign is a miracle which identifies. Now, that's what they wanted. They wanted Him to perform a miracle that would prove He was the Messiah. They said, "This miracle of casting out a demon doesn't prove it to us because we think you did that by the power of the Devil and not by the Power of God. Now, you perform a miracle or give us a sign that'll prove you are the Messiah, unmistakably." What did Jesus say? "He answered and said unto them, An evil and adulterous generation seeketh after a sign; and there shall no sign be given to it but the sign of the prophet Jonah: for as Jonah was three days and three nights in the belly of the [great fish — and I explained yesterday the word is not whale at all but sea monster or great fish]; so shall the Son of man [that was He Himself Christ] be three days and three nights in the heart of the earth." Now, some people try to say this (this is not true) but I have heard young Bible students who thought they were getting a little knowledge of the Greek say in the Greek it is an idiomatic expression and that it was customary in the Greek language to use portions of a day or a night to represent a whole day. And when Jesus was to be three days in the grave that any portion of three days... Now, if He were Crucified and buried Friday just before sunset; although, He was only in the grave, we will say, maybe two or three minutes before sunset, two or three minutes on that day meant that one day — Friday. They counted that a whole day. Then from Friday sunset because days ended at sunset and did for two or three hundred years after the Crucifixion of Christ as a matter of fact. It was only two or three hundred years this side of Christ that they began to try to end the days at midnight by a manmade watch. So, then, from Friday sunset to Saturday sunset you'd have a whole day and they count that another day and then Sunday morning at sunrise you got a part of another day and they said, there, that's parts of three days but it isn't three days and three nights by any process of arithmetic or reasoning or anything else unless you are reluctant and unwilling to receive the Truth of God and want to twist it around to have your own way. Now, even if it were true, which it isn't, that that is the meaning of the Greek language, it is not the meaning in the Hebrew language. And I remember one time I was preaching on this very thing in a country schoolhouse and there was a student of a Bible college there that was trying to trap me just like the Pharisees tried to trap Jesus and trying to show how wrong I was and he was going to show his smartness, he was going to Bible school. And so he challenged me and made this very statement. I said, "Well, you claim that that is an idiomatic expression that in the Greek language that any parts of days and nights would be equivalent to the whole day." I said, "But would that be true in the Hebrew language?" "Well, no, not in the Hebrew in the language but this was in the Greek, Mr. Armstrong." I said, "Yes, certainly. But did you notice that Jesus said the only sign He would give was the sign of Jonah. 'For as Jonah' was a certain duration of time. Now, you say it's parts of days and nights, one day and two nights in the grave 'so shall the Son of man be [that long] in the heart of the earth.'" "Now," I said, "Let's go back to Jonah which was written in the Hebrew language in the Old Testament." And here it is. Jonah the first chapter and the seventeenth verse: "Now the ETERNAL had prepared a great fish..."
Not a whale, had prepared a great fish. God prepared that fish for that purpose. It was God who created whales and elephants and every other kind of animal that there is anyway and He was able to do this. He "prepared a great fish to swallow up Jonah. And Jonah was in the belly of the fish three days and three nights." That was translated out of the Hebrew and that is three days and three nights. Now, then how much time was in a day or night? Did Jesus know how much time? Jesus said, speaking of day and night that if man walks in the day or he stumbles in the night or something, there are twelve hours in day and twelve hours in the night as Jesus plainly said in one place. And then again, what is the Bible definition of a day or a night? Back in the first chapter of Genesis here it is so plain a little child can understand it if we want to understand instead of if we want to reject the Bible, refute it and have our own way and make the Word of God of no effect; absolutely make it of no effect by our tradition. Now, the fact that Jesus rose on Sunday which He didn't and it isn't a fact it is merely a supposition of tradition. And by those traditions people are making the Word of God of no effect. Are we going to do that? Are we going to believe tradition or the Word of God? Jesus plainly said here in the seventh chapter of Mark that tradition is contrary to the Word of God and you have to decide which you want, because He said, "In vain do they worship me teaching for doctrines the commandments of men. Laying aside the commandment of God you hold the tradition of men." Is that what you're doing, my friends? Have you been guilty of that and not even knowing it? I'm not accusing you because I realize that if you have, you haven't realized it and you've been sincere. But I tell you, my friends, we've been doing a lot of things that we didn't know. And when we know it's time then that we become honest about it and we quit doing these things. Now, notice. "Laying aside the commandment of God..." Is that what the churches are doing? Did you ever hear any preacher tell you that the Commandments of God have been nailed to the cross and that they're done away and we don't keep them today? Have you heard any preacher lay aside the Commandments of God? "...you hold the tradition of men..." Have you seen anyone do that? Christmas is the tradition of men, believing in Easter is the tradition of men: that is not in the Word of God. Now, He said unto them, verse nine, Mark the seventh chapter. If you have your Bible, open it and read it. Mark the seventh chapter and the ninth verse: "He said unto them, Full well you reject the commandment of God [Why? ], that ye may keep your own tradition." And I tell you, my friends, there are many groups of men associated into a group they call a church today that claim they are looking to the authority of the Word of God. They will extol the authority of the Bible. And they claim to follow the Bible and yet they do away with the Commandments of God and they observe these things that are the tradition of men. God tells us to do away with those things, and He says that we are making the word of God of no effect by following the traditions of men. I want you to notice that again. "Full well ye reject the commandment of God, that ye may keep your own tradition." "...teaching for doctrines the commandments of men and laying aside the commandment of God, ye hold the tradition of men." I want to tell you, my friends, the vast overwhelming majority of our American people have been doing that without realizing it. God help us. We haven't even realized we were doing it and it's about time that some voice cried out in the wilderness to open our eyes. Now, let's get back and see what is the Bible definition of a day and the Bible definition of a night when it speaks of days and nights. Now, if it speaks of three days or ten days or thirty days or a thing of that kind, there it is speaking of twenty-four hour days. That is exactly what we mean today in the English language and it's spoken of that way in the Bible. But when it speaks of day and night then it is speaking of day of the light portion when it's sunlight and of night of the dark portion when it's dark. And in other words, the day is between sunrise and sunset and the night is between sunset and sunrise. Now, let's see if that is the Bible definition. What does God say, what is God's definition? Turn back to the very first chapter of Genesis. "God called [there's God's definition]..." "God called the light Day, and the darkness he called Night. And the evening and the morning were the first day." Now, it took an evening, which is a dark period, and the morning which is a light period that God calls day, an evening, which is a dark period that God called night and it took those two periods, one of darkness, one of light, one called a day and another called a night to make that duration of time that is plainly called in the very first chapter of your Bible the first day. Now, how much time elapsed before we got to the third day? A day and a night elapsed here to get us to the end of the first day according to Genesis one. Now, you drop down just a little bit later and God had said a few more things here the next day and more beings had come into being and been created. And here we find in verse eight, "God called the firmament Heaven. And the evening [that's the night part that God called or the darkness that God called night] and the morning [the light part that God called day] were the second day." Now, there is another night and another day. There is two days and two nights and it's called the second day. Now, verse thirteen: "And the evening [another dark part that God called night] and the morning [another light period that God called day, there's now three nights and three days] were the third day." So, the duration of time that makes up the third day is very plainly three days and three nights. Three night periods or dark periods and three light periods called day to make three days and three nights. Now, as Jonah had been called as a human messenger to give a human warning to prevent a physical destruction to the city of Nineveh and as Jonah had been called to go over and warn the Ninevites, but being human he didn't want to do it and so God had him thrown... He tried to escape from a command of God by boarding a ship and trying to sail away from God. But God had him thrown overboard and He prepared this fish to swallow him up. Now, as I read to you in the preceding broadcast, "Then Jonah prayed unto the ETERNAL his God out of the fish's belly..." Now, he was still alive and conscious in there and it is all a miracle of God and there's a great reason for it because, my friends, this is the type of Christ, this is the very thing that is the only sign, the only miracle, the only miraculous proof of identity that Jesus gave to prove that He is the Messiah, that He is your Savior and mine, the very Son of God that can...through whom we can approach God and through whom we can be reconciled to God that we may receive the Spirit of God, be begotten of God and later become born of God into the very Kingdom of God. Now, Jonah prayed to the ETERNAL his God out of the great fish's belly and said, now, here's what he said, "I cried by reason of mine affliction unto the ETERNAL, and he heard me; out of the belly of [and in the King James Bible you find the word hell and that is translated from the Hebrew word which is sheol. And the Hebrew word sheol is the word that is elsewhere translated the grave and that's exactly what it is and what it means. Wherever you find the word grave in the Old Testament it comes from the Hebrew word sheol, this same identical word.]..." So, he was in a grave. He was in a veritable grave. He was still alive in the grave. Now, he was buried alive. Now, he was in a grave in which he certainly would have died if he had remained buried. "Out of the belly of [the grave] cried I, and thou heardest my voice." And then God had him cast out or resurrected from that veritable grave of death after which now Jonah was willing to obey. And he went over to Nineveh and he warned the Ninevites of their sins and what would happen as a result and the Ninevites repented. And the Ninevites therefore averted the disaster. It did not happen because they repented at the preaching of Jonah. Now, Jesus Christ came to warn this world of its sins. And if we will repent, He came to be the Savior of the world. He went down into the grave of death for three days and three nights. As Jonah was three days and three nights, so was the Son of man three days and three nights in His grave. Now, the only sign He gave was that He would be three days and three nights in the grave. Was He? I wonder if He was in the grave exactly that duration. Now, if I can find it real quickly and it's in a booklet I am going to tell you about if I don't get it here. It's in the twenty-seventh chapter of Matthew I think. Anyway, He rose as He said after three days. "Now the next day, that followed the day of the preparation, the chief priests and Pharisees came together to Pilate, saying, Sir, we remember that that deceiver [meaning Christ] said, while he was yet alive, After three days I will rise again." Now, you can't get after three days by a Friday sunset burial and a Sunday morning resurrection. After, if He was buried on Friday and He rose after one day, one day after Friday night would be Saturday night at least, that's the least you could make it. And two days would be Sunday night and three be Monday night. But we know that at Sunday morning at sunrise, He had already risen because He was not there. The grave was empty when Mary and the other Mary and the women arrived. So, now continuing, "Pilate said unto him, Ye have a watch: go your way, make it as sure as ye can. So they went, and made the sepulcher sure, sealing the stone, and setting a watch." Now, "In the end of the sabbath [or as other translations have it 'after the sabbath'], at dawn the first day of the week, came Mary Magdalene and the other Mary to see the sepulcher. Behold, there was a great earthquake: for the angel of the Lord descended from heaven [or had descended], and came and rolled back the stone... His countenance was like lightning, his raiment white as snow: And for fear of him the keepers did shake, and they became as dead men. And the angel answered and said unto the women, Fear not ye: for I know that ye seek Jesus, who was crucified [He was crucified]. He is not here [that was Sunday morning before sunrise it was yet dark as one of the accounts say. And it was approaching sunlight, it was at dawn, while it was yet dark early, very early on Sunday morning]..." And the angel said, "He is not here: he is risen [already risen]." He had already risen prior to that time. "Come, see the place where the Lord lay [that means in the past tense 'did lay']. And go quickly, and tell his disciples..." Now, notice "he is risen, as he said". That's the point I want you to get. He rose as He said. And He said He would rise after a duration exactly of three days and three nights. You can't get three days and three nights between Friday sunset and Sunday morning. 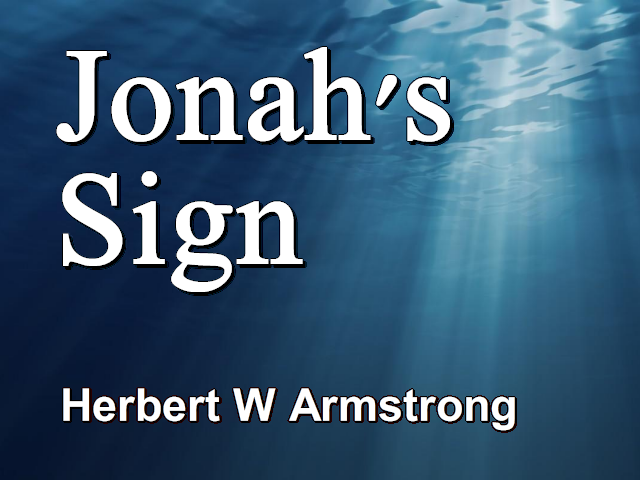 Now, "the sign of Jonah prophet: For as Jonah was three days and three nights in the belly of the great fish; so shall the Son of man be three days and three nights in the heart of the earth." He did rise as He said and the Bible says He did, verily was the sign fulfilled. If you want the truth about it, write for the booklet that will explain it that I will tell you about in just about thirty seconds. He said then, "The men of Nineveh shall stand up in the judgment..." Here's that Judgment mentioned. What Judgment? The men of Nineveh were all dead when He spoke. They had died but He says they're going to stand up. Now, where were they, in Heaven, Hell or where? No, they were in their graves. "And the hour is coming," said Jesus at another time, "when all that are in their graves shall come forth, they that have done good unto the resurrection of life and they that have done evil unto the resurrection of judgment." And here are those of Nineveh that are going to come to this resurrection of judgment and they are going to stand at that time in judgment with this generation and they shall condemn it for "they repented at the preaching of Jonah; and, behold, a greater than Jonah is here." But those people, those Pharisees would not repent. "The queen of the south shall rise up in the judgment with this generation [she's going to rise up in a resurrection too], and condemn it: for she came from the far ends of the earth to hear the wisdom of Solomon; behold, a greater than Solomon is here." There is going to be a resurrection and a judgment in which those people will appear and the books and even the book of life will be opened and you'll find it in the twentieth chapter of the Book of Revelation. Well, that's all I have time for now. Write in for the booklet on the Resurrection if you want the truth of this. Resurrection — just ask for that. Tell me the name of the station to which you're listening. Ask for the Resurrection.